When someone has writer’s block or isn’t able to think creatively about their writing, he or she is often told to “write about what you know.” (As an aside–that link to the Purdue OWL Web site is invaluable for writers. They have tremendous resources. Aside ended.) I’m not insinuating that I currently suffer from “the block,” but I am saying we’re going to be talking about a place I know very well: the Austin-Bergstrom International Airport. While it’s probably true that I’ve spent more total hours at my layover destinations (Dallas/Ft. Worth or, God help me, Chicago O’Hare), I’m always one to arrive with plenty of time before my flight, so I’ve logged some hours at ABIA. For starters, it’s a smaller airport with only 25 gates. As soon as you walk in the sliding glass doors, the “vibe” of the place grabs you. It doesn’t have the half-sterilized, over-trafficked feel that most airports do. 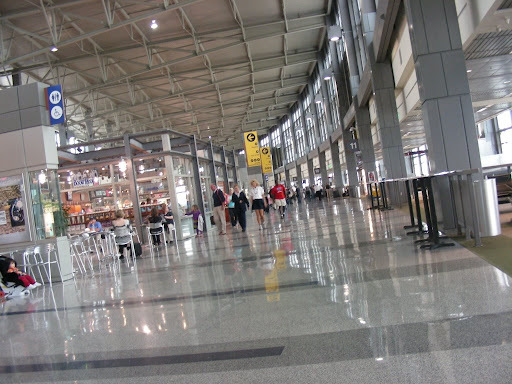 The Austin-Bergstrom International Airport served nearly 8.9 million passengers in 2007. It was also the first facility in the nation to be converted from an Air Force base to a commercial airport. The airport immediately reminds visitors that they have arrived at a place that is mindful of its heritage — political, cultural, and natural. A Live Music Stage features local performers. Well-known Austin-based companies operate many restaurant and gift concessions. Landscaping consists of native and xeriscape plantings. On Wednesday, I enjoyed a bit of this “well-known, Austin-based” restaurant food at 5:30 a.m. as I was flying home to Pittsburgh. Two breakfast tacos with egg and sausage and a cup of coffee from The Salt Lick’s airport stand: $9.90. Breathe it in–that’s the smell of getting ripped off, my friends. I’m not saying they weren’t delicious, but for $9.90 I’m fairly confident in my ability to find a hen myself and demand it produce an egg for me. Structurally and aesthetically, it’s a beautiful public building. Airport terminals can often feel oppressive with low ceilings and thousands of people (I’m lookin’ at you, O’Hare), but the lofty feel of the (somewhat ridiculously) high ceilings at ABIA give you room to breathe. Security can sometimes have lines that wrap around for days, but I’m always astonished at how quickly they move. On Wednesday, TSA was so well prepared that I had no wait at all. Even though I appreciate the peace of mind that added security brings to the flying experience, I never thought I’d actually be tipping my hat to the people who feel you up before your flight. And speaking of TSA, they’ve produced a “Holiday Travel Guide” for what you can and can’t bring on the plane. If you’re traveling soon, this will save you time (and potentially embarrassment). And a tip from my own personal experience with ABIA–arriving an hour before your flight (if you know what you’re doing) is all the time you’ll ever need. Don’t believe the hype. Thanks for one’s marvelous posting! I certainly enjoyed reading it, you are a great author.I will ensure that I bookmark your blog and will often come back later in life. I want to encourage you to definitely continue your great posts, have a nice morning! Hi! I could have sworn I’ve visited your blog before but after browsing through many of the articles I realized it’s new to me. Hello Dear, are you genuinely visiting this website daily, if so then you will without doubt take fastidious experience.